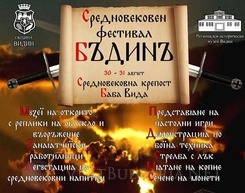 The medieval fortress “Baba Vida” will host a historical festival on August 30 and 31. “MODVS VIVENDI” as well as Chigot will entertain guests and residents of Vidin. An open air museum, coinage, medieval drinks tasting, archery, fencing and other medieval games will be performed in during the event. Guests of the festival will be able to participate in the activities. A live concert will be performed by Erinay.